Chick Henderson was a quiet self effaced man, born Henderson Rowntree. He became one of Britain’s most popular singers in the late 1930’s. He was born in North England in 1912. As a boy he loved to sing and was an active member of a church choir. He was heard by Harry Leader and given an audition, who immediately signed him up in 1935. Chick started recording with the band in 1935 and made three records on the Eclipse Label. His first recording was ‘Zing Went The Strings Of My Heart’, matrix 2544-1, on 15th June 1935, and released on Eclipse 1011. Chick made his first broadcast on the BBC in August 1935. Chick joined the Joe Loss Band in September 1935 after having been heard on radio. He cut the first Joe Loss records on 22nd October 1935 in the London HMV studios, ‘Wyoming In The Gloaming’, OEA-1998-1, and ‘The General’s Fast Asleep’, OEA-2000-1. Chick and Joe Loss went on to record over 250 tracks. Even though Chick was the principal singer for Joe Loss, he continued to make records on Columbia and Regal Zonophone with Harry Leader. The mid 1930’s is a period which is difficult for record collectors and historians. 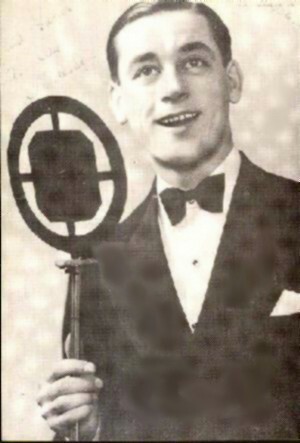 Columbia used the name Harry Leader but Regal Zonophone released Harry Leader discs under a number of aliases such as Wally Bishop, International Novelty Orchestra, and Mel Rose. To complicate things further these sides were released in Australia under all these names and also as The Rythmic Troubadors on RZ. Some Joe Loss tracks also used these aliases. In October 1936, Joe Loss contracted to RZ. Their first RZ record was ‘When Did You Leave Heaven’ and ‘You’ve Got To Blow Your Own Trumpet’. From all accounts Chick Henderson was a shy and modest person who loved to spend quiet weekends with his family and friends, but at least once a month he was in the recording studio with Joe Loss, usually putting down about four numbers each session. Very few recordings required more than one take. In July 1937 he made his first solo recording ‘Greatest Mistake Of My Life’ and ‘Broken Hearted Clown’. He had only accordion and piano as accompaniment. It was not until November 1937 that his other solo disc was recorded on RZ, and it was the only time that the label credit reversed the order, Chick Henderson with Joe Loss. His best seller was ‘Begin The Beguine’ of 5/7/1939, but he made a large number very highly regarded discs. In 1940 Chick recorded eight tracks with Harry Roy, three with Organ Dance Band & Me, and four with London Piano Accordion Band. His last recording session was in 1942 in Glasgow with Joe Loss. He died in 1944 at age 31, after a recording career of only seven years, and having made about 280 tracks. His name is not on the majority of labels. He made 19 with Harry Leader, and 242 (247?) with Joe Loss, plus 2 with instrumental accompaniment. Some of his recordings were not released in Australia in 78 rpm format. Strangely it took many years before EMI started to release compilations on LP and Cassette. HMV OCLP7553, TC SCA 261002, EMI 1986. 2 LP’s WRC, EMI 1984. Please e-mail Doug Hamilton or John Wright if you have any further information on Chick Henderson or his recordings to contribute to this website.